Since January, I have been living at the Rectory in Askeaton as the part-time priest-in-charge of Rathkeale Group of parishes. In recent weeks, my teaching roles at the Church of Ireland Theological Institute and Trinity College Dublin have come to an end, and the I have taken up the second half of my appointment in these dioceses as Director of Ministerial Education and Training. I hope to share some of my vision for this role later this month at both the Ministry Day in Glenstal Abbey on 17 June, and the Diocesan Synod on 24 June. In the meantime, I am contacting all clergy and readers who are active in the diocese, introducing some of my ideas of what a programme of ministerial education and development can look like, seeking exploring hopes and seeking feedback. One area I am beginning to explore is the resources we need for ministry in these dioceses. A new dedicated website or blog could provide planning for the Sunday Lectionary readings in advance, with ideas for sermons, selecting hymns and relating them to intercessions, and pointing to wider web resources. But these need to be explored together, and from autumn on I am planning a number of single-topic study days. How do we nurture spiritual and personal development that can sustain us in our ministry, lay or ordained? How can we develop a life of personal prayer life and rule of life that underpins our role in in leading public prayer? How do we write, structure and lead intercessions? How do we find resources for school assemblies, children’s addresses or confirmation classes? What new publications, books and resources are becoming available? Readers and clergy alike may want to explore developing their ministries in a variety of ways. How can Morning Prayer and Evening Prayer be used creatively interpreted? How do we move from asking what can readers do to empowering and enhancing the ministry of readers? How do we prepare Confirmations and for the seasons in the Church Calendar, beginning with Advent? There are exciting developments in Reader training in the neighbouring Diocese of Cashel, Ferns and Ossory, and there are obvious benefits in exploring how these can be developed in this diocese too. There may be further developments in areas such as Communion-by-Extension, Ordained Local Ministry and team ministry that offer exciting challenges and that need creative resourcing. I am considering regional meetings in places such as Killarney, Moneygal, Limerick and Ennis on a monthly basis, and can be contacted by email at revparrickcomerford_at_gmail.com; or by ’phone on 087 663 5116. In the first of three features on the Reformation, Canon Patrick Comerford looks at Martin Luther and the continental reformation. Martin Luther … did he nail his 95 Theses to a church door 500 years ago? This year, Churches of all traditions throughout the world are marking the five-hundredth anniversary of the Continental Reformation. Although the actual events are shrouded in myths and legends that have developed over the past five centuries, 31 October 1517 is remembered as the day that set the Reformation in motion. Of course, the Church has always been in a state of being reformed, although the principle of ecclesia semper reformanda, which has been attributed not to the Reformers but to Saint Augustine, is used only for the first time by Karl Barth in 1947, and then adapted by Hans Küng in the 1960s. The Church is always reforming itself, and there were great reforms in pre-Reformation days too. One early reformer was Pope Gregory the Great, one of the Doctors of the Church, who reformed the liturgy and structures of the Western and sent Saint Augustine on his mission to England. From the mid-14th century, John Wycliffe and the Lollards were demanding Reform, and William Tyndale, who worked on an early translation of the Bible, was executed before the Anglican Reformation began. On the European Continent, early voices and movements for Reform included Peter Waldo and the Waldensians, John Huss (1369-1415) of Bohemia, and Desiderius Erasmus (1466-1536), the Dutch humanist who remained a Roman Catholic priest, but who influenced the Continental Reformers through his translation of the Greek New Testament. Martin Luther (1483-1546) was born in Eisleben, Saxony, and received his name because he was baptised a day after his birth, on the Feast of Saint Martin of Tours. He was educated by the same religious community whose members included Thomas à Kempis and Erasmus, and then studied theology, philosophy and law at Erfurt. In 1505, he was caught in a thunderstorm, struck by a lightning bolt and thrown from his horse. He was terrified of death and divine judgment, and cried out: ‘Help! Saint Anna, I will become a monk.’ He became an Augustinian friar, and devoted himself to a life of fasting, prayer, pilgrimage and penance. He was ordained in 1507, began teaching theology in Wittenberg in 1508, received his doctorate in 1512, and became a professor of theology. Luther proposed an academic discussion of indulgences when he published his 95 Theses on 31 October 1517. Myth now says that on that day 500 years ago, he nailed his 95 Theses to the door of All Saints’ Church in Wittenberg, although in reality Luther had sent them to the Bishop of Mainz in an effort to stimulate debate. Luther taught that salvation and, subsequently, eternal life are not earned by good deeds but are received only as the free gift of God’s grace through the believer’s faith in Christ. He challenged the authority and office of the Pope by teaching that the Bible is the only source of divine revelation. His marriage to Katharina von Bora, a former nun, challenged clerical celibacy, while his translation on the Bible made it more accessible and transformed German culture. 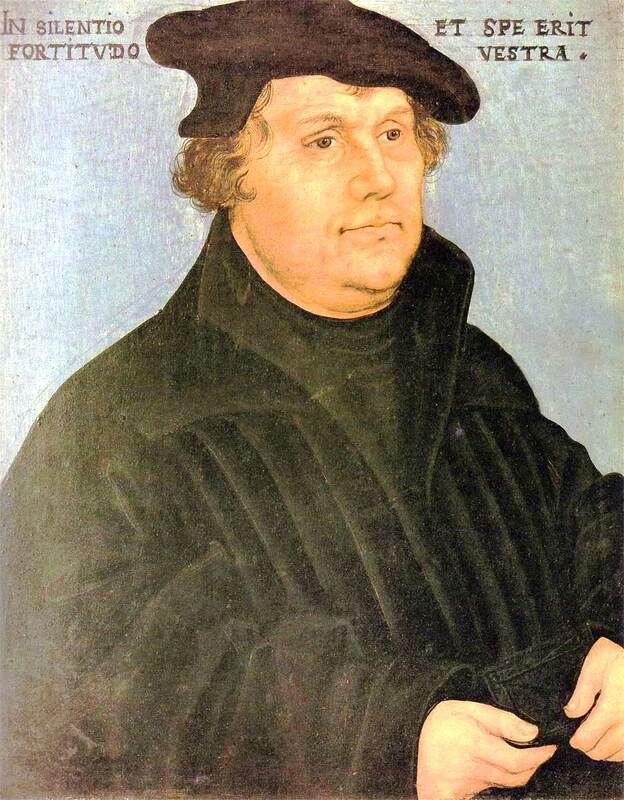 Luther had no plans to cause schism or to form a new Church. But his refusal to renounce his writings at the demand of Pope Leo X in 1520 and the Emperor Charles V at the Diet of Worms in 1521 resulted in his excommunication by the Pope and condemnation as an outlaw by the Emperor. Both failed to silence him, and his pamphlets and books were soon widely read throughout Europe. Meanwhile, parallel Reforming movements began with Huldrych Zwingli in Zurich in 1519, and with John Calvin in Geneva. Luther’s writings triggered wars and civil turmoil and wars throughout Europe. But he died in his own bed early on the morning of 18 February 1546, and was buried beneath the pulpit in the Castle Church in Wittenberg. He has left a divided legacy, from his hymns to his anti-semitic tirades. But the arrival of his writings in in Cambridge would make it the nursery of the English Reformation. Next issue: the Anglican Reformation.